PressingsPressings made to customer specification using a vast range of materials including Mild Steel, Stainless Steel and Exotics such as Inconel, Duplex and Monel. 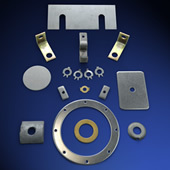 Extensive tooling capabilities in partnership with knowledge, understanding and skill, provides the company with the ability to manufacture a wide range of pressings including Tab Washers. ND Jig & Gauge has the capability to create bespoke items to your specific dimensions and working drawings.